The Auto Marketing Blog: Subaru, the Muse of Advertising Inspiration? I was on a plane reading the classic marketing book Where the Suckers Moon: The Life and Death of an Advertising Campaign when I came across a rather interesting remnant from Subaru’s brand campaign launch in 1992. Their big brand spot used a very familiar phrase, “May the best machine win.” Now where have I heard that before? I had thought the “New” GM was borrowing heavy from Lee Iccoca’s Chrysler days, and I still believe that, but I never considered they were borrowing from Subaru too. 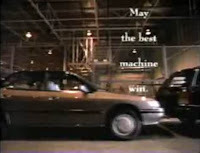 GM’s “May the Best Car Win” campaign certainly sounds very similar to Subaru’s change of direction in 1992. What makes it even more interesting is that Subaru was responding to a down economy where “ostentatious living is out and practicality is in. And all of us, as consumers, are rediscovering basic values….” Sound familiar too? It’s funny how history repeats itself. Hopefully for GM their luck with this language is more successful than Subaru’s eventual dissatisfaction with the campaign. Though, to be fair, Subaru never challenged every four-door sedan on the planet to a race. So maybe GM’s tweaks to Subaru’s concept will bear better fruit? The other company looking back to Subaru for inspiration is Honda. One of Subaru’s main competitors has taken the concept of “Love” that Subaru used just last year and extended it for their own use in the “Everybody Loves a Honda” campaign. Subaru’s tagline was “Love. It’s what makes a Subaru, a Subaru” and it had an accompanying ad called “Love Letters”, the tells of owners thoughts about the brand. It’s definitely a similar concept to Subaru, but taken further by it’s competitor Honda. This got me thinking about what other ideas might be culled from Subaru’s past? Maybe there is a goldmine of creative inspiration that most consumers would never recall as Subaru’s that could be recycled by other automotive brands. So there you have it. Copywriters can now fire up Microsoft Word and start playing with the words: change one word, reorder the words, or just expand on a concept. I’m sure there is a future campaign for someone else to execute. Good luck! I, too, read "Where The Suckers Moon" and the parallels between Subaru then and now and the industry then and now are eerily familiar. (Of course, when I read it I was selling Subarus so it hit home in a lot of ways. Are they gonna crack 200K units this year finally?) This book should be a must-read for anyone interested in automobile marketing. Wow just goes to show that life comes full circle. Everyone borrows from everyone.